Supports auto discovery of TFS components, health model using Monitors, includes tasks, diagnostic and recovery for certain failures. 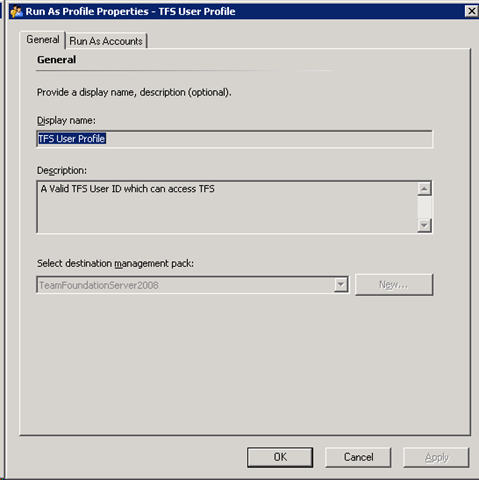 The Team Foundation Server (TFS) 2008 Management Pack monitors exposed services of TFS. This management pack includes event rules and monitors. It is designed to proactively monitor quality and availability of TFS services and even automate recovery in some scenarios. Alerts indicating configuration issues and connected data source changes. Verification that all dependant services are running. Don’t forget to set the “TFS User Profile” to a valid TFS User ID under Administration | Security | Run As Profiles | TFS User Profile after you import the Management Pack.